Replay Destinations, a fully integrated destination development company, has appointed Studio Piet Boon, an internationally renowned design studio, as lead designer for Half Moon Bay Antigua, the first new resort and real estate development of its kind in the Caribbean. Acclaimed for award-winning luxury hotel and residential projects in Europe and the United States, the Amsterdam-based firm will lead the overall architectural and interior vision for the Rosewood Residences, as well as the interior design for the new Rosewood Half Moon Bay, set to take shape on 132 pristine acres surrounding one of the world’s most celebrated beaches. In collaboration with preeminent Caribbean architecture firm, OBMI which is handling architecture for the Rosewood Half Moon Bay, Studio Piet Boon will introduce a new understated contemporary design by layering the sensibilities of traditional Caribbean architecture with a modern and distinctly environmental aesthetic. With a highly-regarded multi-disciplinary body of work, Studio Piet Boon’s portfolio is comprised, amongst others, of AIRA Residences in Kuala Lumpur, Huys at 404 Park Avenue South and 101 Wall Street in Manhattan New York, as well as extraordinary custom homes and beach villas in destinations spanning Paris, Amsterdam and the Caribbean. Studio Piet Boon conceptualized the exterior and interior design concept for multiple hospitality projects varying from the international award-winning restaurant The Jane in Antwerp Belgium and Andaz hotel in Seoul South Korea to the Park Hyatt Hotel Hanoi in Vietnam and the Alon Hotel Las Vegas. Established in 1983 by Dutch designer Piet Boon, the company’s distinctive design sensibility has also extended into custom furnishings, fixtures and many other interior related products. Recognized for a remarkable ability to balance functionality, aesthetics and individuality into one-of-a-kind design experiences, Studio Piet Boon will effortlessly blend the structures with the area’s verdant surroundings. Emulating a design that reflects the lush locale, both the aesthetic of the Rosewood Residences and the interiors of Rosewood Half Moon Bay will represent a contemporary interpretation of the Caribbean vernacular utilizing a natural palate and materials with colorful accents. 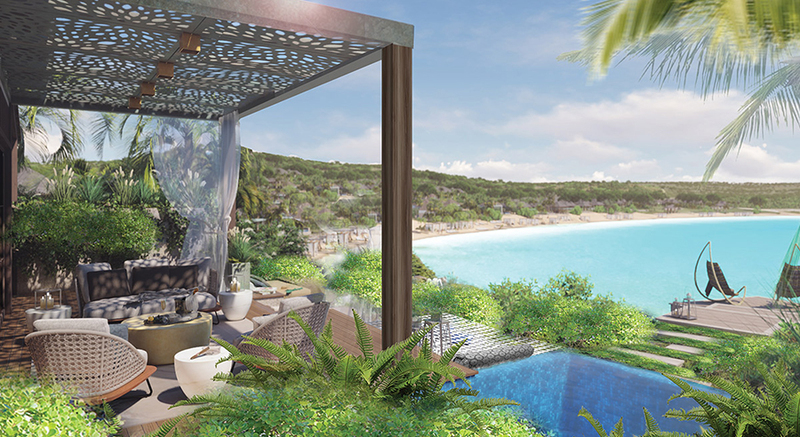 Set to open in 2021, Rosewood Half Moon Bay will feature 47 pavilion-style suites, including a three-bedroom presidential suite, and will be flanked by a collection of Rosewood Residences, each thoughtfully designed and architecturally stunning showcasing captivating views. Amenities will cater to the desires of today’s global explorer, with unobstructed ocean views, private infinity plunge pools, hammocks, open-air baths and shower gardens with live orchid walls that blur the boundaries between indoors and outdoors. Studio Piet Boon will employ a natural design palate that will flow seamlessly from the resort to the residences connecting each experience to one another and to nature. Open concept layouts and immersive living elements throughout the development will reinforce the natural beauty of Half Moon Bay while also providing opportunities for adventure and experience.